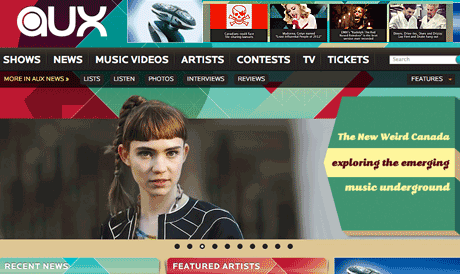 Aux is a music TV channel and website that champions new and emerging artists. Aux has produced original telelvison shows like ExploreMusic with Alan Cross, Master Tracks, Strange Notes (hosted by George Pettit of Alexisonfire), the alt.sessions and Garageland, and publishes stories about Canadian and international artists on the web and via a monthly iPad magazine app. In February 2009, Aux participated with CBC Radio 3 and Exclaim! to launch X3, a new collaborative cross-promotional platform which sees all three outlets air or publish feature content spotlighting a particular "Artist of the Month". X3 artists of the month have included K'naan, Malajube, Thunderheist, Japandroids, Apostle of Hustle and The Rural Alberta Advantage.